Trainee teachers from our 2016/17 School Direct programme have just returned from their unique enhanced international placement in The Netherlands, with Zwolle University. 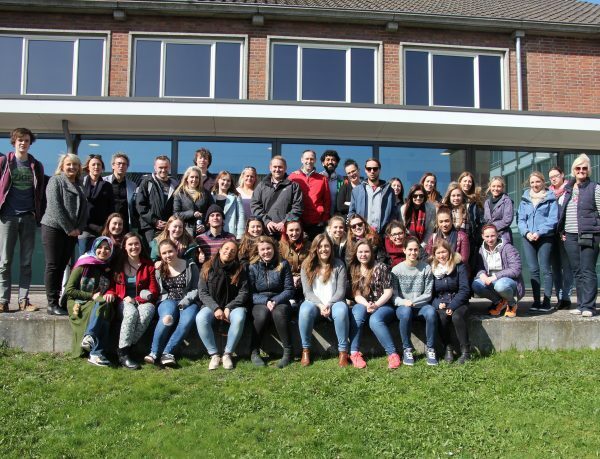 In the week-long placement, the group of 17 future primary school teachers spent time at Zwolle University, observed lessons in local schools and had the opportunity to network with fellow trainee teachers from other European countries. The trainee teachers were joined on the trip by Gill Latos and Linda Jones from BTSA and Joanne Baines from The University of Derby. Educational leaders from Zwolle University traveled to Stoke-on-Trent to visit the teaching school and The St. Bart’s Multi-Academy Trust in November. During the School Direct visit this year, Linda spotted a familiar display in one of the Dutch schools. The “Wall of Wonderment” – a display where our trainee teachers document their teaching highlights and “WOW Moments” over the course of the programme – was an idea imported by The Netherlands (pictures below). Fantastic work! We still have places on our School Direct programme starting September 2017. On our programme you’ll also have the unique opportunity for an enhanced international placement in Holland. You can apply for our School Direct programme via The UCAS Portal, by searching for Britannia Teaching School Alliance.